* Please Select Knife Length: 5" 6" 7" 8" 9" 10"
Eastman has manufactured the highest quality, longest lasting and simply the best cloth cutting machines for over one century. Don't compromise quality, use Eastman Cutting Machines! Heavy Duty Multi-Ply Cutting - A versatile straight knife with additional horsepower for heavy-duty cutting of intricate patterns or straight lines. 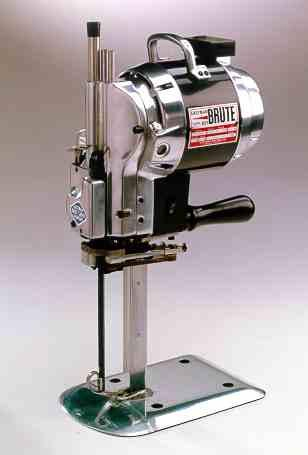 This is the most powerful straight knife garment cutting machine manufactured in the world. Accuracy - Cutting of intricate patterns and tight turns due to the low-profile baseplate and narrow silhouette standard. Continuous, Smooth Running - Perfect fit and continuous running with cross heads, crank and knife slides that are machined to a tolerance within .0005 inches. Efficiency - Simple handling of the machine due to its low center of gravity and the best power-to-gravity weight ratio in the industry. Low Maintenance - Requiring only daily lubrication with the easy-to-use One Shot single-reservoir oiling system. Durability - Built with the highest grade materials available. All shipping by UPS Ground Service. For other options or for international orders, please place your order and we will contact you to arrange proper shipping. If you need other than standard 110V USA Power, and other than Standard Single-Speed Machine please contact us before ordering. Blade Size (inches): 5", 6", 7", 8", 9", 10", 11.5", 13"
(inches): 3.5", 4.5", 5.5", 6.5", 7.5", 8.5", 10",11.5"
SIX MONTH WARRANTY Limited Warranty. Eastman warrants to the buyer that the Brute shall be free from defects in materials or workmanship for a period of 180 days commencing on the date of invoice. Any goods or parts claimed by the buyer to be defective must be returned to Eastman, freight charges prepaid, within the 180–day warranty period. If Eastman determines that the goods or parts are defective in mate- rials or workmanship, Eastman's sole obligation under this warranty shall be, at Eastman's sole option, to repair or replace the defective goods or parts or to provide to the buyer a credit equal to the portion of the purchase price allocable to the defective goods or parts. This warranty shall not apply if defects are caused by product misuse or neglect, if the machine has been altered or modified by the buyer, or if other than genuine Eastman belts, emery wheels, knives or parts are used in the machine. THIS WARRANTY IS THE ONLY WARRANTY APPLICABLE TO THIS PURCHASE. SELLER DISCLAIMS ALL OTHER WARRANTIES, EXPRESS OR IMPLIED, INCLUDING, BUT NOT LIMITED TO, THE IMPLIED WARRAN- TIES OF MERCHANTABILITY AND FITNESS FOR A PARTICULAR PURPOSE. Limitation of Liability. Eastman's liability to the buyer, and the buyer's remedies from Eastman, whether in contract, negligence, tort, under any warranty or otherwise, shall be limited to the remedies provided in the foregoing Limited Warranty. In no event shall Eastman have any responsibility or liability to the buyer for (a) any special, indirect, incidental, or consequential damages, including, but not limited to, loss of use, revenue, or profit, even if Eastman has been advised of the possibility of such damages, or (b) any claim against the buyer by any third party. The price stated for the product sold is a consideration for limiting Eastman's liability. We cut dense materials and they have a tendancy to slow down and tax the power of standard Cutting Machines. After purchasing the Brute we do not have such issues. Nice smooth, quiet operation with more than enough power for our toughest jobs. Purchased this machine to cut denim for jeans. We lay material up 5" high so we selected a 9" machine to give us plenty of height. The Brute has never slowed up in over one month of cutting, plenty of power and height. Price was the best we could find anywhere, but is still on the top end of cutting machine prices. Wish it was a bit cheaper.